THERE IS NO SECRET QUICK FIX FOR THAT INNER THIGH GAP!!! But I am going to give you some great exercises that are going to help you get closer to getting that inner thigh gap. These workouts have been accumulated from different fitness magazines, and across the web. Let me know which ones you like the best and which ones work for you. Click on each picture under its title for a downloadable copy of each workout. How long do you think you can last at this quick challenge. I am currently on day 10 and my quads are burning but every day is getting easier! This challenge seems to be all the rage on instagram right now so I brought it here for all of you to try. Let me know how it goes. Don’t give up!! with help from Women’s Health. These 4 simple moves will do wonders to your workout! Do these four quick moves as soon as you get out of bed in the morning or before you go to sleep at night. 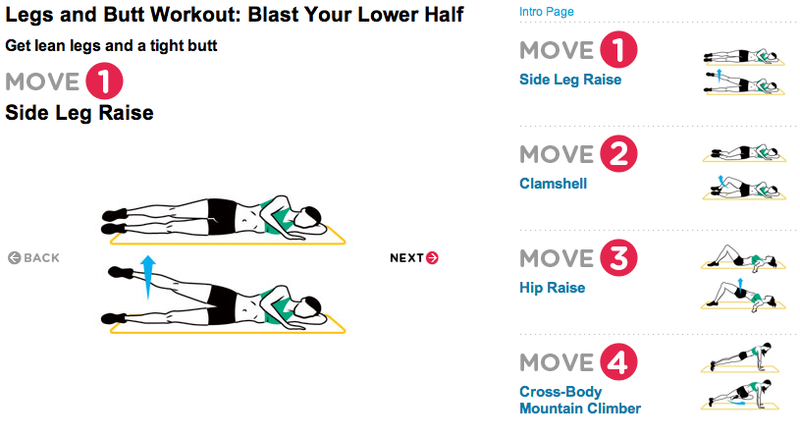 This workout is the perfect workout to do in your bedroom or living room. 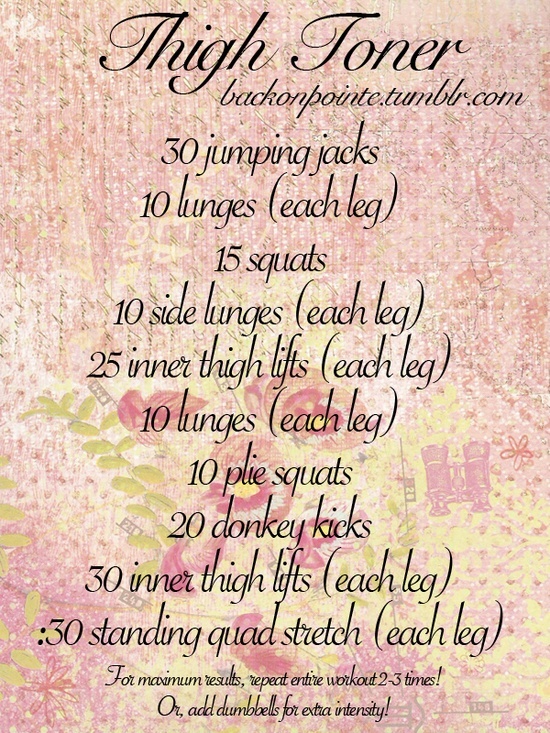 Okay, so this is probably one of my favorite leg workouts that i have gotten from pinterest. it is a quick and simple workout that can be done at any point during the day. I usually do this in between each of my classes, before and after work, or when I wake up and before I go to sleep. Any treadmill lovers out there, well look no further. This is another one of my pinterest favorites, which was taken from Prevention Magazine. What I like best about this is that I normally get really bored on the treadmill because it is the same thing over and over and over again. You are looking at the same wall with nothing changing. This workout goes into interval training and allows you to remain motivated when on a treadmill. If you have not been to BackonPoint’s blog yet than go check it out! This is has everything you need for a workout which is why I give you the Thigh Toner. If you go through this workout 2 times through and 3-5 times a week I know you will feel the burn and after a few week will see results. Good luck to you all as you make your way to lean legs for summer. 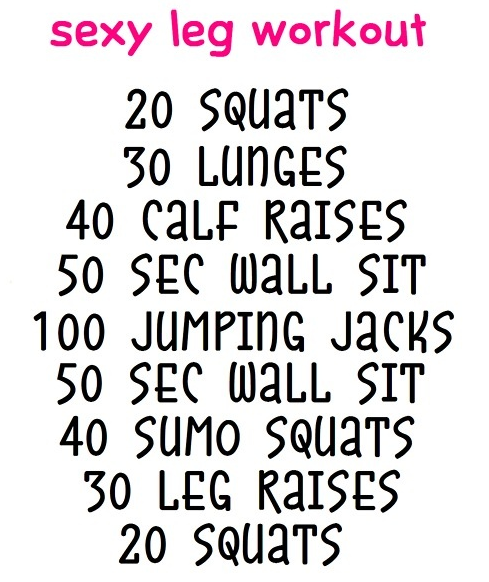 Make sure you do at least one of these workouts for those summer legs you can show off in a bikini or some mini shorts. Have any good leg workouts? Let me know! 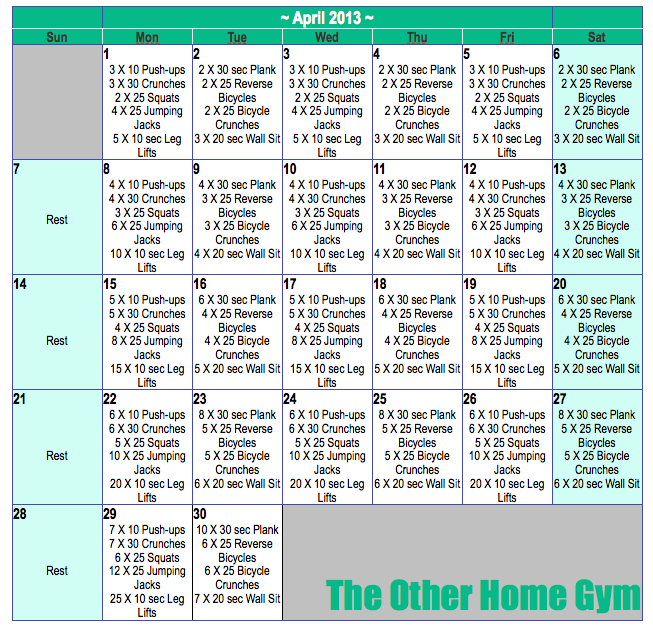 Okay guys so I created April’s workout calendar a little bit different than March’s. Instead of increasing the reps every 2 days, the number is sets increase every Monday and stay the same for the rest of the week. Every other day there are different exercises for you to do! Let me know how this month goes!